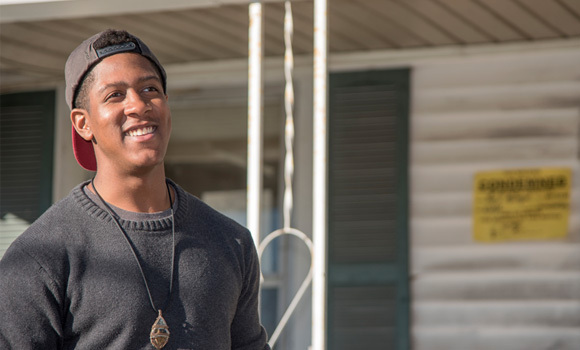 Senior Zechariah Etheridge, a research assistant for UNCG's Center for Housing and Community Studies, conducts an external assessment of a Greensboro home. Zechariah Etheridge’s grandfather taught him that in life, attitude is everything. Now a senior at UNCG set to graduate in December, Etheridge holds tightly to his grandfather’s advice. “I strive to keep a good attitude about everything and always seek the joy out of life,” said Etheridge, who is double majoring in sociology and African American and African diaspora studies and minoring in religious studies. Whether it’s been working at UNCG’s Center for Housing and Community Studies as a research assistant, going door-to-door as a community organizer for the NAACP, or counseling kids at a nature camp in Asheville, Etheridge approaches everything he does with a unique blend of determination, optimism and maturity that can be hard to find these days. Etheridge credits UNCG for pushing him to grow up. Etheridge has been involved in just about everything during his time at UNCG. He’s served as a consultant at the Writing Center, protested local companies with United Students Against Sweatshops, joined Sigma Alpha Lambda, a leadership and honors organization, and immersed himself in his studies. For the past seven months, Etheridge has spent a large portion of his time with the Center for Housing and Community Studies where he researches the intersection between home and health alongside Dr. Stephen J. Sills, the center’s director. Sills is investigating how different ZIP codes in Guilford County impact mental and physical health. Etheridge and the volunteers work on one neighborhood each month. The work has impacted not only the community, but Etheridge as well. After graduation, Etheridge plans to work full time as a management trainee at Enterprise Rent-A-Car in Greensboro, with long-term plans to go to law school. In the immediate future, he wants to make time for some of his hobbies: writing poetry, playing various instruments, reading and enjoying the outdoors. His advice for younger students? Follow the conversation about December Commencement on social media by searching #uncggrad on Facebook, Twitter and Instagram.